Pump wedding bachelorette party badges. Wedding guests witnesses family of bride and groom badge. Badge 25mm Lot of 9 badges fabric liberty and Japanese paper. Badge or Magnet Future MOM pregnancy announcement. Magnet magnet Duo Godfather godmother who tear. Badges 38mm wedding bachelorette party gold and Navy. Badges wedding bachelorette party / bride. Super tonton magnet/bottle opener key holder/magnetic bottle opener/pin badge 56mm. Bohemian wedding bachelorette party badges. Keychain godmother gift godmother Liberty gold 38mm badge. Badge 38mm Super Tata Tata Liberty gift keyring. Wedding guests witnesses family of bride and groom arrow gold badge. Bottle opener Keyring or magnet great witness gift witness wedding bow tie. Badges EVJF 38mm accessory wedding organization funeral life of young girl. Pump wedding Or bachelorette party badges. Zipper Zip zipper badge 25mm to customize the name of child. Thank you teacher Liberty Eloise gift teacher key ring 38mm Badge orange. Earrings "cocotte" history of France paper Origami. Badge 38mm Super godmother gift godmother Liberty keyring. Mirror 56mm Super witness witness wedding gift. Key gold godmother 30mm glass Cabochon and Liberty gift godmother. Super light light golden wedding gift. Super Tata magnet/Pocket mirror/badge 56mm. Magnet magnet 56mm Duo gift Godfather godmother gold confetti. Badge Keychain announcement future pregnancy Tata. 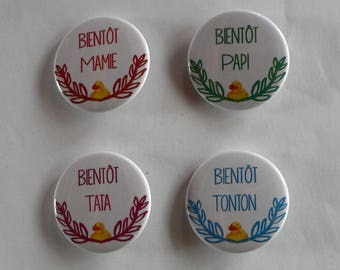 Badge or Magnet-38mm pregnancy announcement soon Grandma-Grandpa-aunt-Uncle-Godfather-mother. Key ring 38mm Super Tata Liberty Eloise Orange badge. Badge or Magnet-38mm Badge or Magnet 38 or 56mm pregnancy announcement. Badge holder key 38mm and I call you Godfather. Teacher Badge 38mm Super Lady Liberty Wiltshire Keychain gift. Encore plus beau en vrai ! Je l’ai reçu très très rapidement il me semble 2 jours après l’avoir commander ! Je suis très très très satisfaite et je recommande énormément !! Duo Cadeau Parrain Marraine en Or Décapsuleur Porte Clés Confettis. Badge Keyring great witness witness wedding gift.